4 Bedroom Semi Detached House For Sale in Sandhurst for Offers in excess of £500,000. 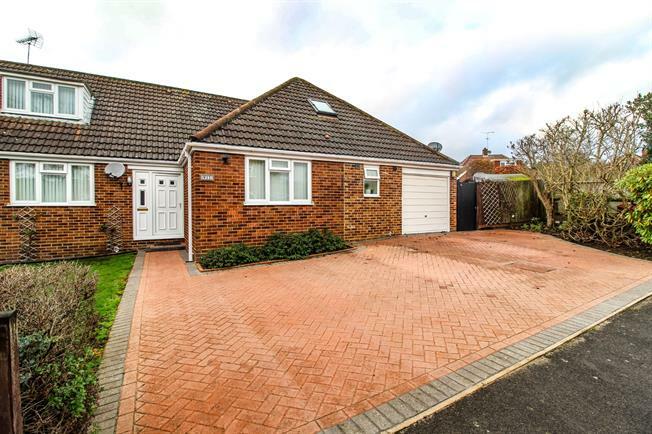 A rare opportunity to acquire a four bedroom semi detached chalet style bungalow with single garage and driveway. Situated in the regarded Sandhurst village on the seldom available St. Michaels road, the property sits approx. 0.5 miles from Sandhurst train station and is ideally positioned for access to local amenities and St Micheals school. The accommodation is versatile comprising a good size living room complete with feature fireplace and sliding doors, a large formal dining area which leads neatly to the recently extended kitchen / breakfast room. The dual aspect kitchen benefits from modern fixtures, fittings integrated appliances and a useful breakfast bar. Adjacent to the kitchen is a good size utility which leads into the integral garage. There are also two downstairs bedrooms, the master of which sports a spacious three piece en-suite with double shower tray and heated towel rack. A newly fitted bathroom competes the downstairs. Upstairs there are two further generous double bedrooms, (the largest of which could easily be segregated into an additional bedroom if required) and are serviced by the family bathroom suite with corner bath/shower and Velux window. There is also and additional office space and plenty of useful eave storage space. Externally there is a large driveway for several vehicles, two private garden areas of which one has a favourable south aspect while the other has a decked area and vegetable patch.